One of the hottest trends in weddings in 2017 is a new take on the traditional wedding meal. Brides and grooms are opting out of traditional chicken, steak or fish option and going all out to impress their guests with a unique dining experience and food that tickles the taste buds! A few years ago, just having food stations was trending. Now the food stations are coupled with a unique experience. Now chefs are expected to prepare the food right in front of the guests and serve it individually. This might include shucking oysters, rolling sushi, a guacamole bar where it is mixed to order, a Mongolian noodle bar, or steak appetizers cooked to order! Food trucks have been popular for a couple years, but now couples are using the food trucks as a late night snack, a coffee bar or for their desserts instead of for dinner. A lot of food trucks are not prepared to serve over 100 people in under 20 minutes so how they are used during wedding receptions is being adjusted. Couples who are looking to have a unique experience but might be looking for cost effective ways to save money might have a morning wedding followed with a brunch reception! A brunch reception can be followed with a coffee, Bloody Mary and/or mimosa bar. You can also set up pancake, waffle and omelet stations where food can be made to order and customized with a variety of toppings. It’s not just about the cake anymore, it’s about a dessert experience! Sure, brides and grooms are serving cake, but they are also serving; pies, cookies, cupcakes, donuts, candy, ice cream, and even sweet drink options. 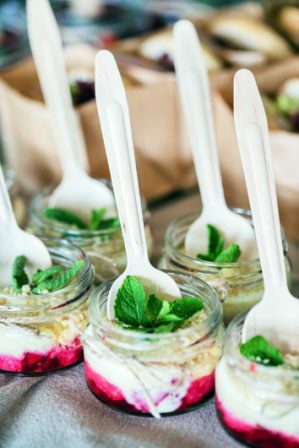 Couples that share a sweet tooth love to expand their sugar options at their wedding! Microbrews and farm to table restaurants are taking the local dining experience by storm and weddings are no less. Brides and grooms want to highlight the local drink and food options on their special day – especially showcasing the local flair to the out of town wedding guests. Buffets and sit down serving styles are out and family style is in! Being able to stay seated, pass dishes, and take what you wants combines both styles with the benefits of both options.